A PRECISION ENGINEERED WORK OF ART! The paddle is scientifically engineered to balance power and pop, drive and control. The premium graphite face is light weight, resilient and durable. The honeycombed polymer core offers soft and quiet play, as well as excellent control over shot placement. A low profile edge guard runs around the periphery of the paddle to protect its edges, yet is slim enough to reduce mishits of the edge. The paddle weight is an optimum 7.9 - 8.3 Oz, to strike that fine balance between drive and control. DESIGN: A simple, subtle and sophisticated design adorns the paddle face. And a fun perspective design on the outer cover. 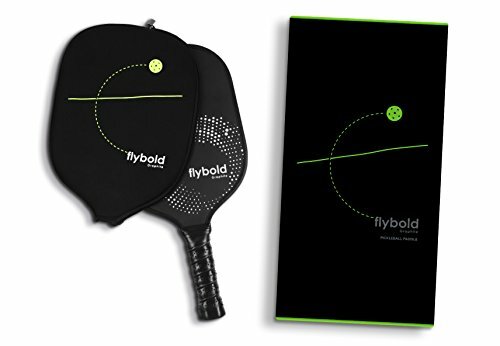 If you have any questions about this product by flybold, contact us by completing and submitting the form below. If you are looking for a specif part number, please include it with your message.